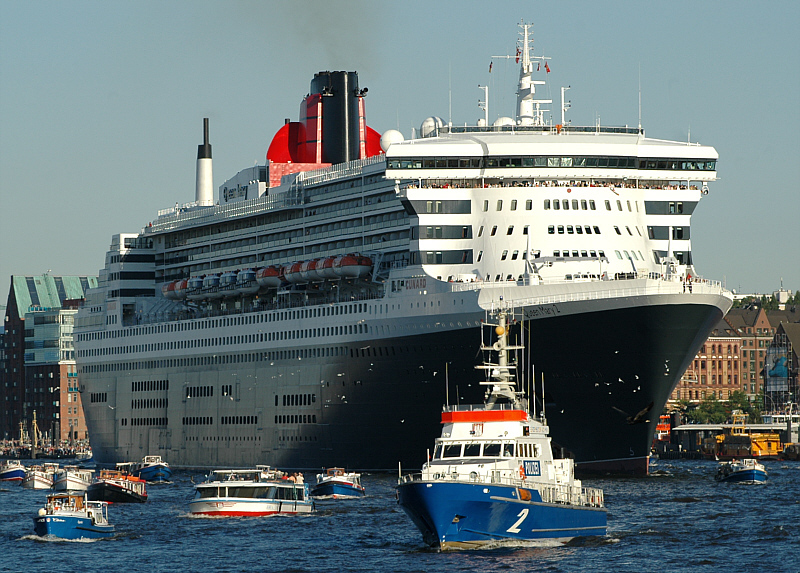 Queen Mary was an ocean liner that sailed the Atlantic Ocean during 1936 – 1967. She was designed to be a high-end transportation express ship, appealing to wealthy travelers crossing between Europe to America. It could accommodate 3000 guests (larger than the Titanic) with all the luxurious amenities on board. The liner featured an indoor swimming pool, salon, ship’s library, children’s nursery, outdoor paddle tennis court, and ship’s kennel. The largest room was the first-class dining room (grand salon), which spanned three stories in height and was anchored by wide columns. The indoor swimming pool facility also spanned over two decks in height. An alternate to the indoor dining room is an exclusive restaurant outdoor Verandah Grill on the sun deck that held up to 80 passengers and was converted to the Starlight Club at nighttime. In 1940, during a return trip to New York the ship was ordered to stay in port due to the international situation of its day – WWII. It was turned from a ship transporting travelers to troops. 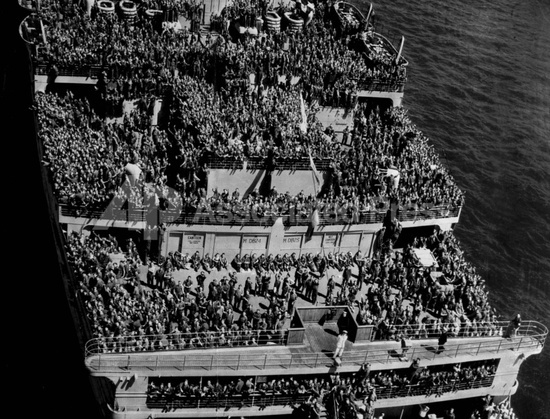 The hull and superstructure was painted drab navy grey, inside luxury staterooms were replaced with triple tier wooden bunk beds with ability to accommodate 15,000 troops, six miles of carpet and 220 cases of china, crystal and art tapestries were exchanged for war time supplies. The ship received the nickname “The Grey Ghost” because of its elusiveness and ability to outrun enem y pursuits. Rather than being a ship of momentary comfort it was transformed to a ship of missional calling. Unfortunately, the church today often looks like the Queen Mary comfort ship rather than of missional calling. Christians have retreated from the world and lined their church buildings with environments and programs in which they never have any contact with the warzone of the world. There is a great need for churches to evaluate its purpose and make necessary changes in effort to engage the culture with the gospel. To do so will call for the church to return to its earliest beginnings found in the book of Acts. Below are some characteristics I found from Acts 13:1-3 that begin missionary movements and are reflective of healthy churches. I hope you will consider these in the days ahead for ministry as you advance the gospel. 1. There was foundational discipleship. As the early Jesus followers met they sought to be obedient to Jesus’ Great Commission to “make disciples of all the nations, baptizing them in the name of the Father, and of the Son, and of the Holy Spirit, teaching them to observe all things that I have commanded”. Christian’s were then witnesses in Jerusalem, Judea, Samaria and on outward (Acts 1:8). Antioch became a home base outside the Jewish world for Christianity, being the first place believers were called Christians (11:26). The church at Antioch was a refuge to persecuted Christians (11:19). It was also a place of faith instruction for new believers, like Saul/Paul (11:26). All of this arose from the congregation as a whole, not hired staff doing the work of ministry. Antioch was a healthy, stable foundation from which effective ministry could be established and advanced. 2. There was shared leadership. At the very least there were 5 leaders who were said to be prophets and teachers. These men were recognized with specific giftings that aided the church to fulfill its mission and vision. The leadership was shared and diverse, representative of the larger Church. Barnabas was from Cyprus, Simeon probably from African regions, Lucius from Cyrene, Manaen was upper class related to the Herods, and Saul from Tarsus. They had varied backgrounds yet God blended them together to accomplish his world-wide mission. The art of leadership is both delegating and developing others. This means empowering others to assist in meaningful ways of service. True delegation is not dumping; it’s developing and deploying others into the mission. For leaders to assume they can accomplish their tasks alone is to take on the role of God. Put simply, this is a pride issue. When leaders operate in isolation without meaningfully involving and developing others there is sure to be some hidden issues of pride or arrogance. Leaders must come to grips that they can do more with others than alone. In fact, people are more affirming and respectful of leaders who develop than leaders who remain independent. When leaders are not developing and employing people to serve the vision then people will become dissatisfied and feel devalued. This is why many teams have track records of few volunteers and low participation. Leaders must learn to define, develop and deploy other leaders. What & Who will be left when you leave? 3. There was authentic worship. Vital to the church’s mission was corporate worship. Noted elements in this atmosphere for worship included fasting, suggesting intense focus on God for specific purposes, and prayer which was reciprocal communication as the Holy Spirit spoke to the church. Thirdly, their worship was faith responsive as they acted on the Spirit’s leading, commissioning individuals to service. Antioch gave two of their best leaders for the cause of missions, no less! In all, worship has a broad meaning in the OT & NT but it is interesting to note these three specific elements. 4. There was evangelistic fervor. Antioch was hub for sending missionaries into regions where the gospel was vacant. This church took Jesus’ command to disciple the nations seriously and at all costs (Matthew 28:18-20; Acts 1:8). Their strategy is important as they started with those who they considered receptive to their message, in Jewish synagogues. However, they also engaged people and places that were hostile to the gospel. Their evangelistic zeal shows how God uses obedience and availability over talent and personality (consider the fact that Saul was once a persecutor of Christians!). 5. There was mutual ministry. As the early church heard from God, responded to His Spirit to spread the gospel they did so by recognizing Barnabas and Saul as missionaries. Before they sent them out they fasted, prayed and placed their hands on them. The placing of hands on them was an act of dedication but also a sign of care and concern for their physical and spiritual well-being. Love and support for these believers was shown through their unity and prayer with one another (see how Paul ends each of his letters with personal care of individuals and requests for prayer). Even more, the believers at Antioch showed Christian compassion and generosity to those in need by providing famine relief to Jerusalem, hundreds of miles away (11:29), and spreading the gospel through sending missionaries (13:1-3). Mutual ministry and care for others goes beyond a couple hours on a Sunday. It’s more than a class or curriculum but requires a culture of Christians to do life together. This is living out the “one another” passages. It is helping, praying, caring, sharing, serving, rejoicing, mourning and loving others. Almost each week on Sundays AM/PM & Wednesdays I am typically the last one to leave the church. One of the reasons why is because I love seeing people hang around talking and sharing their lives. This is what the Bible calls Christians fellowship – koinonia. The Church should be a place where you belong. The reason why is because Jesus Christ died for sinners – all people. There is no one for whom Christ did not die in the goal of you coming to faith and salvation. Will you believe and belong? – How does today’s church more look like a ship of momentary comfort than of missional calling? Do you understand the difference? – What is the difference between a convert and a disciple? – Define what “church” is. What does it mean to be a member of a church body? – What opportunities for foundation discipleship have you found most helpful? – According to Ephesians 4:11-13, what is the role of pastors and the body? – How do you define worship? Is it limited to an event or do you see the larger picture of a lifestyle? – Is evangelism always comfortable? What will it take to reach our community and world with the gospel? – How do you know a church is unified and has mutual ministry? – Look up some of the “one another” Scripture passages. Seek to practice at least one of these each week. Michael Green, Thirty Years That Changed The World, p.5. This was a great blog post. Dr Lloyd Ogilive, former Chaplain of the United States Senate and I, became good friends from 1994-1995 during my job as floor staff of US Senate. He was also former pastor of Hollywood Presbyterian in CA where he was once pastor to Pres Ronald Reagan. It was my honor to talk with him daily as he opened up the United States Senate in prayer at the US Capitol. He invited me to his weekly Bible studies and he is one of my all time favorite people and preachers. He had the voice of James Earl Jones, looked like a Senator and walks with God. I remember him preaching about the Queen Mary in one of his powerful messages. He highlighted similar details about how sadly the ship today turned into a museum and relies on its success from the past but no longer sailing for the Savior in the present. Thanks for taking the time to remind us all that we need to be a hospital for sinners and not a museum for saints. Blessings on your new assignment and you will do great.